K-5 Blogging to Publish Student Writing & Utah Adopts WriteSteps! 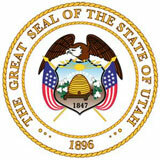 Utah State Board of Education Adopts WriteSteps! If you haven’t found your way into blogging yet, here is a great publishing option your students will love: a free blogging platform that’s so simple, even first graders can use it! Kidblog is a platform students can use over the summer to keep up with their writing skills while honing your students writing voice. It provides an outlet for children to express themselves and their ideas. Once your students have poured their hearts out and discovered their writing voices, you can give them an audience on Twitter with the hashtag #comments4kids. It opens up meaningful discussion and shows your students what they write matters. Make sure to scroll down The Inspired Writer to receive our 5 senses and color word banks. Students can use them during their blog writing. Elementary teacher, Katie Davis, gave WriteSteps Coaching Director, Arlynn King, the scoop on Kidblog. Arlynn: The Common Core standards for writing require elementary teachers to introduce students to digital publishing tools. Can you tell us about your favorite free digital tool for publishing student writing? Katie: Last year, we blogged regularly in first grade, and we’ll do it next year in my second grade room. Blogging is definitely not just for older kids. 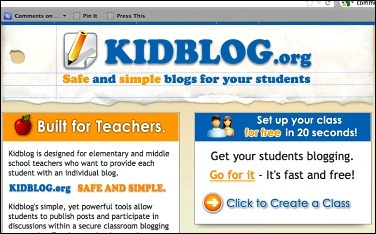 I use the website kidblog.org. It’s free and it’s wonderful for elementary students! Arlynn: Can you describe how it works? Katie: We have a classroom page, and within that, each child has his or her own blog. 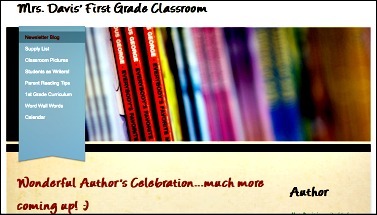 Students can publish the stories they write and comment on classmates’ posts. We do positive comments only in first grade. I can also share the password to our blogs with family members so parents and grandparents can see the children’s work online. It’s very exciting for them, and it gives my students an authentic audience, real feedback from readers, and an engaging writing experience. Arlynn: Do you blog as a teacher, too? Screen shot of WriteSteps Curriculum Creator Katie Davis’ classroom blog from the 2011-2012 school year. Katie taught her students to use kidblog to publish their writing, and she also posted entries to showcase classroom events. Again, this has been very helpful in engaging students, getting them excited about writing, and motivating them to revise – they do lots of revising and practicing before reading a piece for a podcast. It also gives them a framework to begin learning to think about their audience. Arlynn: Is there anything else you’d like to share about blogging at school, Katie? Katie: I also use my classroom blog as my “newsletter” to parents and families. I update it weekly with curriculum we are working on and tools for parents to work with their children, like word lists, book recommendations, and websites. I use the blog to post snack schedules, volunteer schedules, district and school information and events, at-home reading tips, and pictures or videos of what’s happening in our classroom community. It’s a great way to facilitate effective, efficient, and frequent communication with the parents and families of my students. They comment on it frequently, and I can respond to their questions quickly. 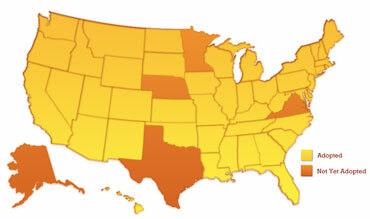 The writing standards require elementary students to “With guidance and support from adults, use a variety of digital tools to produce and publish writing, including in collaboration with peers.” This screen shot from www.corestandards.org shows which states have adopted the standards. Arlynn: Are there other technologies you’re using to make digital publishing accessible to K-5 students? Katie: My district also has iPads, which makes blogging even easier for lower elementary students. I can use QR codes for our website and my students can just scan a projected image of a QR code in order to get to their blog. They no longer have to type the whole web address. I have also created digital stories with my students using imovie. Because they were first graders, we did this together as a team, rather than independently. We discussed what we wanted to add: pictures the students have created, stories they have written, their voices reading their work, and the musical choices we thought fit with our digital story. We have had a “red carpet premiere” of our movie in the library with guests and popcorn! Many of these ideas I gained from working with the National Writing Project and learning from many other amazing teachers in that community. Arlynn: Thank you for sharing, Katie! WriteSteps has been approved by the Utah State Board of Education to be used in Utah classrooms for a period of five years. The WriteSteps curriculum was reviewed by members of the Instructional Materials Commission. The commission is comprised of a variety of state educators and non-educators from across Utah. The purpose of the state’s recommendation of instructional materials is to provide Utah schools with the best core-related materials. The adoption process also provides for consistent contract pricing of the recommended materials at the lowest price for Utah’s schools. WriteSteps is pleased to announce the winners of our 2012/2013 TeacherStar contest! The videos submitted were wonderful and we are excited to share them on eWriteSteps. The following teachers received $250.00 each for their submissions. Devin Dusseau-Bates, a third grade teacher from Britton Deerfield Elementary School, submitted a video on Scoring with a Rubric (Lesson 3.2A Day 12). Barney Watson, a fourth grade teacher from Britton Deerfield Elementary School, submitted a video on Focus Skill Review (Lesson 4.2A Day 9). Nancy Stahl, a kindergarten teacher from Britton Deerfield Elementary School, submitted a video on Opinion Writing (Lesson K.4 Day 1). Sara Ball-Vadeboncouer, a first grade teacher from Greenacres Elementary school, submitted two lessons on Informative Writing (Lesson 1.3 Day 5 and Day 9). Thank you to everyone that took the time to participate in our TeacherStar contest! In an effort to increase our videos to teach the nations teachers, any teacher that submits a video we use to publish on eWriteSteps, will receive $200.00! For an example, you can watch the modeled video on Informative Writing, submitted by Sara Ball-Vadeboncourer, here. Melon, chartreuse, carnation, rumbling, hearty, mellow, crackling. What do all of these words have in common? 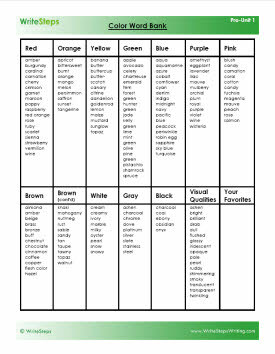 They are all words that can be found in our Five Senses and Color word banks. The word banks encourage students to review past knowledge and to use the words listed to integrate the content in their writing. 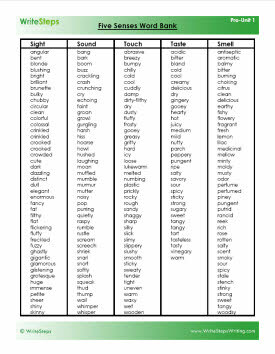 It’s time for your students to expand their vocabulary and get their creative juices flowing! WriteSteps welcomes our new Conference Coordinator, Christina Chau, to the team! Christina has a background in education from her time as a substitute teacher. Her role is to plan, coordinate, and direct details of all conferences, meetings, and conventions WriteSteps attends. She makes sure the events during the year run smoothly! During her spare time, Christina enjoys last minute excursions out of town with her family. 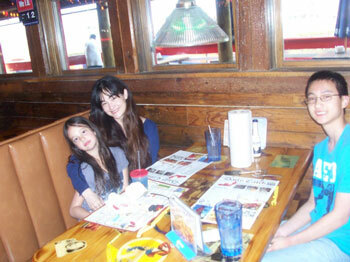 They travel to California as much as they can, where they spend time visiting beaches and amusement parks. This year, they plan to visit different National parks to experience the beauty of the outdoors. Stop by the WriteSteps booth at the Staff Development for Educators Conference in Las Vegas, NV! Kim Gates, National Presenter, can answer any questions you have about our award-winning, research-based, 100% K-5 Common Core writing and grammar program! Denise Dusseau, Awareness Ambassador and Curriculum Creator, is exhibiting in Chicago, IL at the Staff Development for Educators Conference. Stop by and say hello! While there, you can sign up for a free trial to eWriteSteps, which automatically enters you into a drawing to win a new iPad! Drop by our booth at the Colorado Association of School Executives Leadership Convention in Breckenridge, CO and say hello to Kim Gates, National Presenter, to get all of your Common Core writing questions answered! You’ll be glad you did!